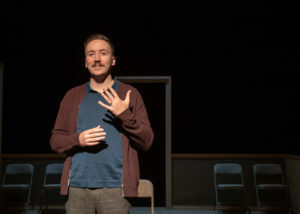 “Good Standing,” written by Matthew Greene, directed by Jerry Rapier and produced by Plan-B Theatre, is a solo play about Curt Brown, a gay Mormon who just married the love of his life. Now he is facing excommunication from the church that he was raised in. Set in the disciplinary hearing that is referred to as a “trial of love” where Curt must face 12 men, six advocating for him, six against, trying to decide whether he should remain a “Mormon in good standing.” Each of these men giving his thoughts on Curt’s actions, while Curt gives his thoughts about these men. Austin Archer, who not only plays Curt, but all 12 of the men on Curt’s disciplinary council, gives a wonderful performance. He easily slips between characters, giving each of them their own voice and body language. Archer fits each character well, at times rigid and uncomfortable, at others emotional. His delivery and timing make the audience laugh and cry, because he makes the characters real. The set was simple and clever. Easily recognizable (to anyone who has spent time in a Mormon church) as one of the many classrooms in a church. With its carpeted walls, split by a chair rail and the cushioned metal folding chairs. Parts of the walls were missing though. This is for the best. If they had been whole, the audience would have had the obligatory painting of Jesus staring at them throughout the show. The lack of that painting helps remind the viewer that this is not a story about whether Jesus thinks gay marriage is right, but about the people in the room deciding the spiritual fate of a young man who fell in love. 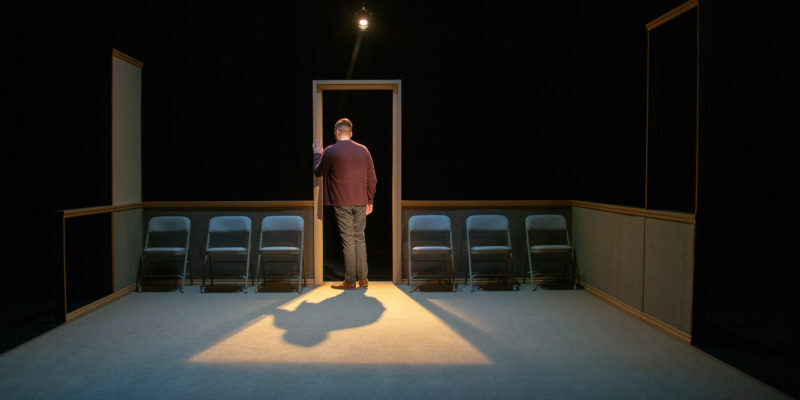 Delightfully written, beautifully acted, “Good Standing” is all around a very well-done play. It runs for 70 minutes, with no intermission. While this seems long for a solo play, for me this wasn’t an issue. The minutes flew by quickly. It will be showing at the Rose Wagner Black Box theater for one more weekend (October 26-28) and then the production is off the United Solo Festival in New York, NY for a show on November 4th. Tickets go fast, find yours and more information here. I recommend trying the waitlist (it worked for me) if tickets are sold out. The waitlist opens one hour before each showing. Katherine Rogers is a junior at the University of Utah, majoring in Communications. She is also intern at CATALYST Magazine.